As long as I can remember I have been fascinated by wolves. I’d always known them to be beautiful, graceful and very intelligent animals but I hadn’t necessarily realized how highly socialized they were. It is pretty amazing how the different types of individual wolves work together as an effective family unit…the pack. Everyone has their role to play. I began to learn more about wolves after joining Wolf Awareness Inc (WAI), a Canadian non-profit organization whose primary goal is to foster an awareness and appreciation of wolf ecology and conservation, back in the 1990’s. One of the educational programs offered through WAI was the opportunity to sponsor a wolf in the wild. Since the sponsored wolves were radio-collared, we received regular updates about ‘our’ wolf. And ‘our’ wolf was Nakoda – the Alpha female of the Peter Lougheed pack in Alberta. 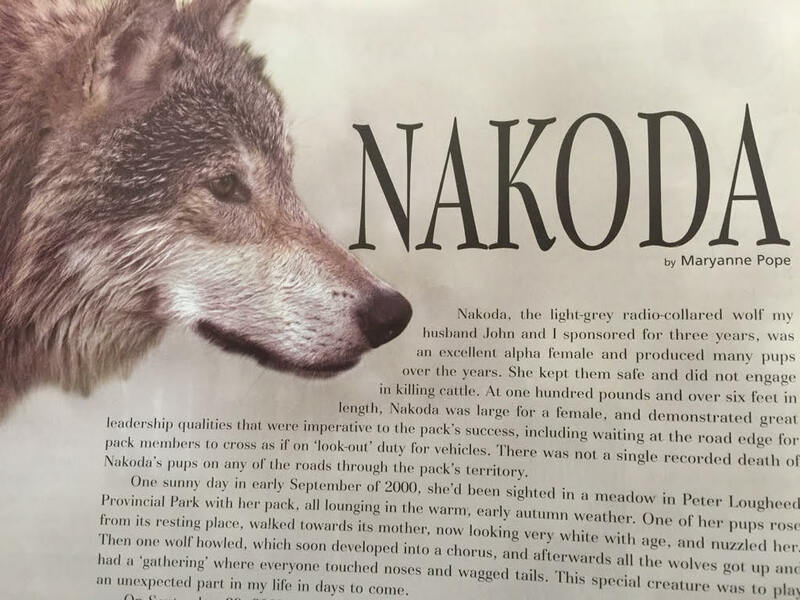 As it would turn out, Nakoda inadvertently taught me more than I ever could have imagined…not just about wolves, life, loss and love but also, from a spiritual perspective, just how intricately connected everything is. Mostly, however, Nakoda helped me understand about the fundamental importance of the pack – be that a wolf pack, a police service or a human family. With the recent wolf culling in Western Canada – a misguided attempt at curbing the decline of the caribou population – I have found myself thinking a great deal about the significant impacts of an individual wolf’s death on the pack, as well as the ramifications of the loss of an entire pack on the surrounding ecosystem. As is the case with any issue that needs addressing, it is often the personal connection – the individual story – that actually leads people to make a change. For me, it was Nakoda who ignited my passion for wolf conservation. 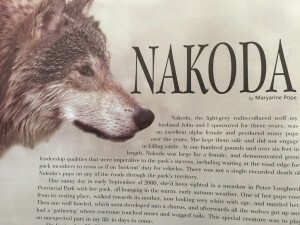 So perhaps reading about Nakoda will help others view the wolf situation in Western Canada from a different perspective…that of the heart and soul. To read my story, Nakoda, here is the link (published in CreaturesAll magazine in 2008). To learn more about the wolf culling in Western Canada please visit Wolf Awareness Inc or Raincoast Conservation Foundation.